The application of heat is frequently employed by torturers. It produces immediate and long-term effects that are similar to those caused accidentally, but it is often possible to determine the deliberate nature of the injury if it is widely distributed in different parts of the body or if there are numerous similar lesions. For this reason it is important to take a detailed history in order to learn the nature of the agents used, the situation and posture of the subject and the duration of the application. Of course, if the victim was blindfolded or hooded during torture, he may not be able to describe the method of burning. In late cases, it is important to enquire as to the immediate effects and appearance of the wounds and how long they took to heal. If there was merely initial erythema or blistering and no infection supervened, it is likely that there will be no permanent scarring but if there was infection, sloughing and delay in healing for a month or more, recognisable scarring would be expected. The pattern of scarring gives a clue to the method used. Flame burns caused by setting clothing alight leave different patterns from the application of blowlamps or other flames. Caustic or acid burns may leave a trail indicating the victim’s posture. Scarring tends to be more florid, perhaps with keloid formation than similarly-configured scars caused by scalding with boiling water. Heated metal rods, branding irons or electrically heated devices such as smoothing irons or soldering irons often leave scars of distinctive shape and if in multiples, they make accidental injury most unlikely. Melted candle wax or plastic give a characteristic pattern of scarring which indicate the flow of the hot liquid, and burning rubber tyres such as are placed round the neck in “necklacing”, leave burns over the whole upper body. Cigarettes are a particularly common torture weapon. The scars they leave depend on the way the cigarettes were applied to the skin. If they were touched lightly or simply brushed against the skin they may leave no scar or something that is indistinguishable from a scar from acne, chicken pox or insect bite. On the other hand, if the cigarettes were deliberately stubbed out and held immobile on the skin, the scar is often characteristically circular about one centimetre in diameter, with a hyperpigmented periphery (usually with a relatively indistinct periphery) and an atrophic, hypopigmented, “tissue paper” centre. The feature that corroborates allegations of deliberate infliction of the burns is the presence of patterns on a part of the skin surface that the history indicates would be exposed. 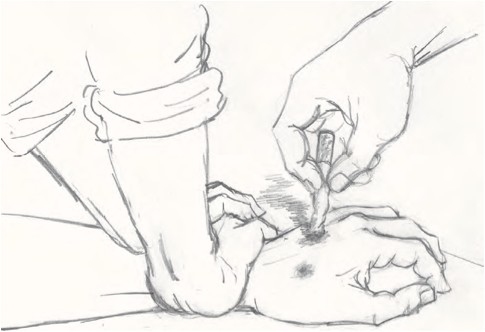 Thus, if the victim was strapped to a chair, there may be a line of scars on the knuckles, up the forearms or on the front of the thighs.